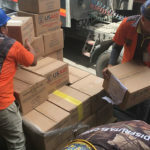 Buckner International is preparing four containers of humanitarian aid to send to Haiti, where a 7.0-magnitude earthquake killed thousands Tuesday evening. Dallas-based Buckner International is preparing four containers of humanitarian aid to send to Haiti, where a 7.0-magnitude earthquake killed thousands Tuesday evening. Buckner, through its international adoption affiliate Dillon International, provides adoption services and humanitarian aid in Haiti. Randy Daniels, vice president of Global Operations for Buckner, said the organization is desperately seeking financial and in-kind donations to help the effort. “We’re rallying our resources to send a variety of emergency aid items to victims,” Daniels said. Daniels said donors may give in two ways: For in-kind donations, Buckner is taking deliveries of requested items from 8:30 a.m.- 4:30 p.m. weekdays. In-kind donors are encouraged to contact the Buckner Center of Humanitarian Aid to schedule drop-offs by calling (214) 367-8080. The Buckner Center for Humanitarian Aid is located at 5405 Shoe Drive, Mesquite Texas 75149. To give financially, donors may call the Buckner Foundation at (214) 758-8050 or online at www.buckner.org . The containers are being provided by Global Aid Network, another U.S.-based aid organization that has previously collaborated with Buckner to provide shipping containers for Buckner International’s shoe distribution drive, Shoes for Orphan Souls. Buckner had announced earlier it also was accepting financial donations for Haiti relief through Dillon, to be used for Hope Hospital and Hope Village, a private hospital and orphanage in Haiti that collaborates with Dillon for adoption of orphan children. For more information about Buckner relief efforts in Haiti, go to www.buckner.org or www.dillonadopt.com .